Conventional sundials do not indicate correct standard time. If a conventional sundial is perfectly adjusted - that is, with the number 12 pointing due north and with the gnomon's angle of elevation equal to the latitude where the sundial is used - then the sundial indicates correct solar time. That is, the sundial will indicate a time of twelve o'clock when the Sun is at its highest point in the sky. There are two reasons why standard time does not agree with solar time. The Sun is at its highest point in the sky when it appears to be directly to the south of the observer. On any given day, the time when the Sun is directly to the south is different for every longitude, but in standard time "12 o'clock" occurs simultaneouly across each time zone even though every time zone covers a wide band of longitudes. The second problem is that the length of a solar day varies. That is, from the time when the Sun appears directly to the south of the observer to the time the next day when this happens is not exactly 24 hours -- it only averages 24 hours over the course of a year. By the early 17th Century, the world of astronomy was in difficulty. Observations of the positions of the Sun and planets did not agree with the model of the Solar System that everybody believed in. 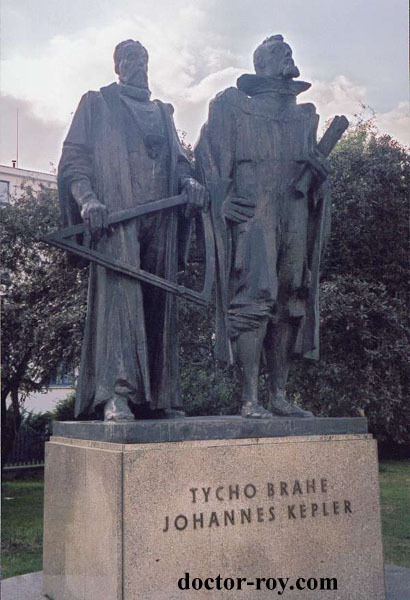 Tycho Brahe in particular made meticulous observations for many years to put the matter to rest, but either Brahe's observations were full of errors, or the planets did not move in circular orbits. Johannes Kepler found the answer. The Earth takes about 23 hours and 56 minutes to rotate once on its axis. During that time the Earth also moves through roughly one degree of arc in its orbit around the Sun, so after 23 hours and 56 minutes, the Sun does not appear in exactly the same place in the sky. The Earth has to rotate for about another four minutes for the Sun to appear in the same place. But this four-minute amount varies throughout the year. Johannes Kepler discovered that this phenomenon and all of Tycho Brahe's observations were accounted for if the planets moved around the Sun in elliptical orbits with their speed varying so that the line from the Sun to the planet sweeps out area at a constant rate. This is now the accepted model of the Solar System and the basis of all the calculations I use for my sundials. 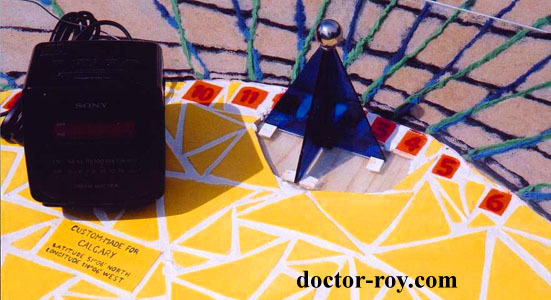 A sundial is better than a digital clock because it's easy to read in bright sunlight. First prize in an amateur contest for an earlier prototype not shown on this page. A sundial is better than a wristwatch because it doesn't leave tan lines. My sundial production has ground to a halt. I have received very positive comments about the two sundials I have made so far, but I consider them to be prototypes and I have not been completely satisfied with the results provided by the materials I used. I have more ideas and my next sundial may have all the elements I want, but production is very time-consuming (I want it that way) and I do not expect to start work on my next sundial until a customer expresses an interest. If you are prepared to pay $2000 for a custom-made standard-time sundial, let's talk. You are Visitor #34119 to this page.